For a couple of guys who may never again play for the Knicks, Nate Robinson and Eddy Curry sure have a way of making headlines without actually doing much of anything. For example, the NBA fined Robinson $25,000 yesterday for comments that his agent made, in which he suggested his client be traded. (It appears that the Knicks' strategy of giving Nate a platform from which to state that he personally wants to remain a Knick didn't work.) Unsurprisingly, the players association plans to challenge the fine, which is unprecedented, as far as anyone can remember. 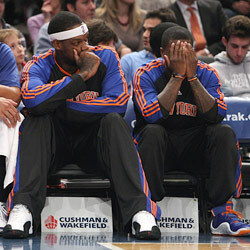 Or take Eddy Curry (please! ), who's been a DNP for the last five games. Yesterday, Mike D'Antoni admitted that Curry may not play again this season, as the Knicks groom Jonathan Bender, who might even figure into their plans for next year. Curry said last week that he hopes the Knicks buy him out — which apparently you can say without getting fined — and the Knicks could free up $2 million of cap room for 2010 if Curry accepts a buyout in the off-season roughly equal to the veteran's minimum. Ah, 2010. So close now, we can taste it.